George J. Eltz, Jr. published a superheterodyne construction article in the November, 1923, Radio Broadcast magazine. The article was one of several published around the same general time that utilized the very popular RCA UV-1716 long wave IF transformers. Superheterodynes of this vintage seem to be fairly scarce, and the “Eltz” described in this section is the one and only example that I have ever seen. This radio was once owned by the venerable Dale Davenport and I’m sure that he was planning to restore it someday. That day never came. Rear chassis view of the Eltz superheterodyne. 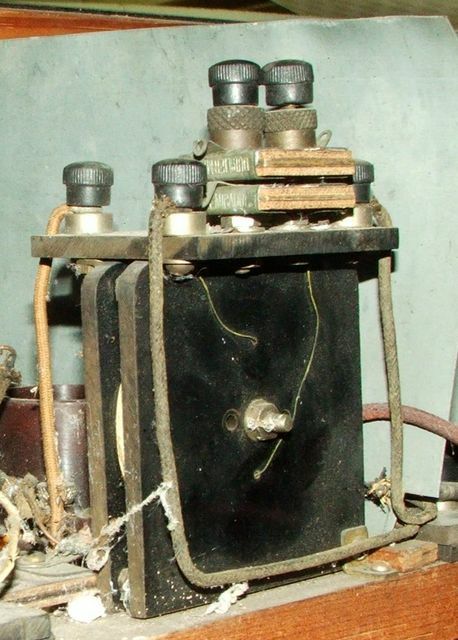 Some of the main defining features of this radio include the three UV-1716 transformers with a metal shield between them and the “special” IF filter transformer (the large black square object towards the left side of this photo). There are two main features of this set that deviate from the standard Eltz construction article. These two features include the antenna coupler (shown on the right side of this photo) and the use of two audio transformers. The standard Eltz circuit used a loop antenna only and just one audio transformer. Close up view of the Eltz antenna coupler. This component was probably hand made by the builder of the radio. Close up view of the Eltz oscillator coupler. This is another component that was probably hand made by the builder of the radio. 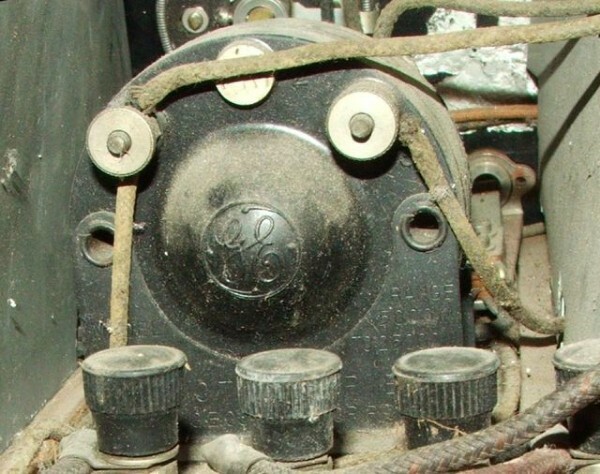 Close up view of one of the RCA UV-1716 long wave IF transformers. 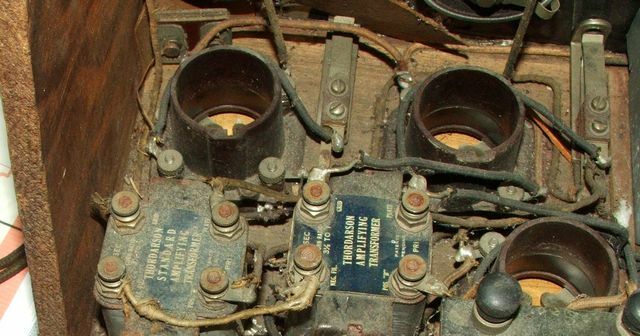 These transformers were very popular in many of the first superheterodynes to be built. Though some sources indicate that they are very efficient at about 47 KC, their actual maximum peak is at 30 KC. 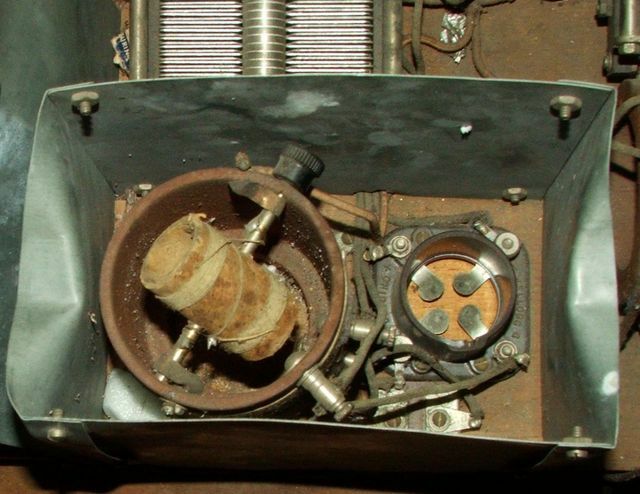 Close up view of the “special” IF filter transformer. This component probably defines the Eltz superheterodyne more than anything else. 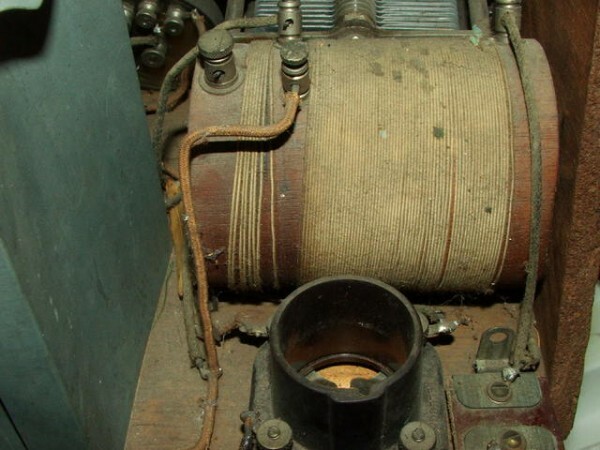 The transformer has a primary of 200 turns of number 29 wire wound on a 1” diameter wood or bakelite core and a secondary of 1500 turns of number 36 wire wound directly on top of the primary. The length of the core is .25” and the outside diameter of secondary is slightly less that 3”. The primary coil is shunted with a parallel combination of a .005 mfd capacitor and a .0025 mfd capacitor, making an equivalent value of .0075 mfd. The two screws holding the capacitors together (with two thumbnuts each) are much longer than they needed to be, possibly to allow enough room for more capacitors if needed. Close up view of the Eltz audio amplifier section. The table below records the pass band characteristics of the Eltz “special” IF transformer. The main peak of this transformer was at 43.9 KC (gain = 17.5) but there was a smaller peak at 74.1 KC (gain = 6.6). The two peaks were due to the very close coupling of the primary and secondary coils. The secondary coil was referenced to A-. The four scans above comprise the entire Eltz superheterodyne construction article that was printed in the November, 1923, Radio Broadcast magazine. One last photo of the Eltz “special” IF transformer. The patent date on the two capacitors is 6-10-24, which means the radio was built sometime after that date. The Eltz superheterodyne shown and described in this section no longer exists. It was sold some time after Dale’s passing at a local auction in Fort Smith, Arkansas, and the new owner parted it out and sold the pieces on eBay. I was able to purchase the Eltz “special” transformer for a very small amount. It’s kind of sad to think that this early superheterodyne survived for nearly 95 years only to be parted out in late 2018 for a few measly bucks. It’s historical significance apparently meant nothing. E.I.S Leutz Model “C” IFs< HOME >General Instrument Corp.